Teeming with a diverse assortment of sea life, the sparkling azure waters of Key West beckon snorkelers, scuba divers and fishing enthusiasts alike. 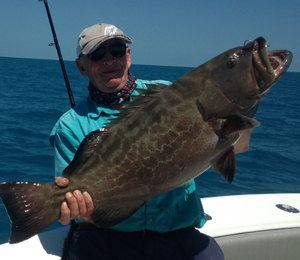 The balmy climate yields rewarding saltwater fishing excursions throughout the year. 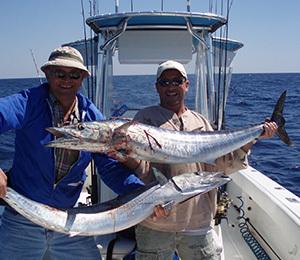 Key West fishing charter provide all of the necessary fishing supplies, and they offer the advantages of captains who are familiar with the most prized local fishing spots and with the extensive roster of species that swim these waters at any given time of the year. There are several options for the angler when it comes to deciding where to cast the line. In the immediate coastal waters that flow over the shallow stretches of grass and sand known as flats, such species as barracuda, sharks, redfish, tarpon, permit and bonefish are abundant. Backcountry is defined as the shallow waters north of Key West that wash over the uninhabited and pristine mangrove islands along the gulf. 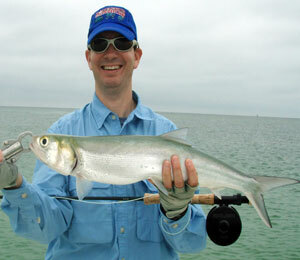 The term is also used to describe the technique of Key West light tackle fishing. 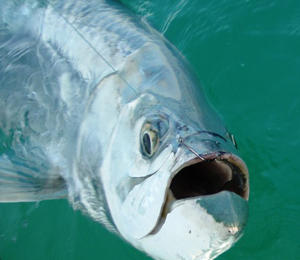 Key West backcountry fishing offers a plentiful bounty of tarpon and permit. For those who prefer to venture offshore for some Key West deep sea fishing adventure, quests for prize-winning catches reward anglers with reeled in gems that include billfish such as sailfish or Blue Marlin, kingfish, sharks and more. These deep waters also offer such tasty delights for the dinner plate as Tuna, Wahoo, and dolphin or mahi. A history of shipwrecks off of the Keys has ensconced the remains of these ships in their final underwater resting places. Encrusted with coral and barnacles, these wreck fishing locations provide sheltered habitation for several varieties of grouper and snapper. Sharks, amberjacks, bonito, permit and barracuda also lurk about the timeworn ships. The colorful coral reefs that frame the Keys also offer havens to grouper and snapper and attract schools of cero mackerel. The springtime inshore waters are brimming with tarpon, while sailfish and snapper take over the depths offshore. During the summer months, sport fishermen take to the flats on their missions to catch trophy-worthy tarpon, permit and bonefish. The beautiful iridescent green dolphin fish coax offshore anglers for the summer season. During the autumn months that transition summer into winter, the waters continue to host some of the summer’s offerings while gradually welcoming the expansive lineup of fish that takes up residence each winter. Those who enjoy the element of surprise will revel in winter fishing, when an impressive array of species populates the inshore flats. There are bluefish, grouper, mackerel, barracuda, snappers, jacks, redfish, cobia and many other potential species that a fishing hook may grab. The vast varieties of fish available during these months render fall and winter as the peak fishing season in Key West. Whether setting out for a day on the water with the family or striving to reel in a record-breaking sailfish, the clear blue waters of Key West are host to an extensive variety of fish and crustaceans to reward fishing conquests of any skill level. With such a lengthy listing of fish species boasted by Florida’s fishing charter boat captains, Key West fishing charters have rightfully been reputed as one of the world’s most spectacular fishing experiences.